Content by Tony Macklin. Originally published on July 14, 2011 @ tonymacklin.net. Harry Potter and the Deathly Hallows, Part 2 is bursting with dark fury. It's good versus evil. Harry (Daniel Radcliffe) meets the vicious Lord Voldemort (Ralph Fiennes) in a final reckoning, a clamorous fight to the death. Hogwarts is under siege, and its inhabitants, young and old, are fodder. Harry desperately pursues means to save them and to fight and destroy his brutal adversary. There have been eight Harry Potter movies in ten years, based on seven novels (1997-2007) by J.K. Rowling. 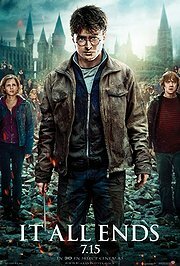 The first half of Harry Potter and the Deathly Hallows was released in 2010 to favorable reviews. It looks as though Part 2 may receive even stronger reviews. One might assume the final movie of the Harry Potter franchise might coast, rest on its past laurels, and plan to appeal to its loyal audience. But it's much more. Harry Potter and the Deathly Hallows, Part 2 is a potent, dramatic dynamo. It careens to its fateful, explosive resolution, resounding with character and conflict. Daniel Radcliffe still is credible and firm as Harry, who has to struggle for survival under extreme duress. Rupert Grint as Ron and Emma Watson as Hermione still have great appeal as Harry's faithful friends. And Matthew Lewis has grown up to give heroic stature to Neville Longbottom. Ralph Fiennes is fearsome as Voldemort, and Helena Bonham Carter is winsome and wacky as Bellatrix Lestrange. Alan Rickman speaks portentously as the mysterious Severus Snape. Maggie Smith (Professor Minerva McGonagall) and Julie Walters (Molly Weasley) wield delightful fiery wands as the spirited opponents of the minions of evil. Much of the old gang is back from Michael Gambon (Professor Albus Dumbledore) to Robbie Coltrane (Hagrid). They're very welcome. Director David Yates puts his multi-talented charges through their challenging and memorable paces. The 3-D is impressive. Cinematographer Eduardo Serra creates a spell that is bleak but palpable. The original music by Alexandre Desplat has sweep and is evocative. Steve Kloves again is the screenwriter, but novelist Rowling puts a few obstacles in his path. The latter part of Harry Potter and the Deathly Hallows, Part 2 plunges into religious allegory. It's much more obvious than the deft touch in the past. Fortunately the movie is resurrected by action. Another potential pitfall is the Epilogue, set in the future. Harry Potter and the Deathly Hallows, Part 2 at the end becomes Leave It to Beaver Heads for Hogwarts. What was an express ride and a wild trip becomes a commuter train. Ward and June Cleaver and the Mertzes are on a railroad platform. The Epilogue is pedestrian and pat. One expects more. The ending is surprisingly punchless, and underwhelming. But how do you compete with young Harry, young Ron, and young Hermione? You can't. They're ones of a kind. Good night sweet princes and princess.